Largely criticized for their ?clich?? lyrics, Fall Out Boy?s newest album offers a great contrasting sound to their previous albums. I continue to argue that the words are not in any way clich? to other artists, and rather just talk about similar topics that are found countless times in all forms of music. Either way, I don?t let the fact that they sound moderately like anyone else ruin the fact that I like the band, for the most part, and their new CD. One day you will look behind you and you will see we three, and on that day, you will repent, and we will send you to whatever god you wish. I saw these guys on Conan--I had never heard of them before--and I just didn't get it. What's the deal with these punk bands that just aimlessely bob around and stuff? The singer sings into the ground and the guitarist looks as though he's having convulsions or something. And, I must say, it's the first time I've ever seen anyone strum a bass for the entire song long...weeird. Lol, I agree fully on the performance, and it almost turns me away from the artists completly when I see it. The song on track sounds so vastly different from the live version that it makes them less like artists and more as digital creators of music. They obviously have little stage presence. P.S. Have you seen how huge Conan is! I never knew he was so tall. Kris Anaya and the other members of An Angle have a lot of potential, and I think that's what has dissappointed me the most about this album. If Anaya could write a song that matches his skill for creating beautiful vocal melodies and guitar lines, perhaps one that is about more than just getting drunk and passing out on the floor, An Angle could be a serious force in independant music. Until then, they'll just stay another group with a singer who wished he was Conor Oberst, but with less lyrical prowess. Pretty awesome online radio station. Check out the playlist to see what they've played recently. It's a wonderful mix, and a refreshing change of pace from the Clear Channel homogeneity that clogs local airwaves. Thanks for the heads up! Jean-Luc Ponty, Tom Waits, RJD2, and King Crimson! Man! Dude! This album is a great step up for the band both in its usage of alternative introments and styles, and maturity. I do not know if I like it as much as some of their earlier albums, but I commend them for taking chances and puting out something that is very different from what they are known. Favorite Tracks: Time To Waste, Mercy Me, Burn, and Sadie. I'm about to dive into this one right now; Alkaline Trio is one of the few current pop-punk acts that I dig. Unlike so many of their peers, they're not run-of-the-mill, manufactured product -- they're the real deal. And they're absolutely morbid, in a really great way. Michael, I like your style. Style? I wasn't even aware I had style. Thanks, I guess. Anyway, I just listened to Crimson. While not as immediately catchy as Good Mourning, I like it, and I suspect it'll only get better with a few more listens. And, yeah, "Sadie" is a damn good song -- Alkaline Trio is the only pop-punk band that could write a song about the Manson family without it coming off like a cheap gimmick. Nice. Yes, I'd argue Sadie has a lot to say, and it does it well. It could possibly be my favorite song off Crimson, but I love the piano mix in Time To Waste. I especially like the monologe in Sadie though, it brings a very raw sense of emotion into the song. You're going to lend this to me, right? Ofcoarse, I think you will be surprised by ints contrast to the other albums. 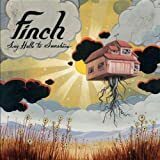 Due to their anger that they, for the most part, created the "screamo" genre, Finch has put out a much darker and less stereotypical album with Say Hello To Sunshine. It reverts back to their earlier album Worms of the Earth and produces something that is definatly not heard as often on today's music scene. But that doesn't mean it tops their last album by any means. This one is great, their are a lot of things I like about it, but it is in a complete different way.